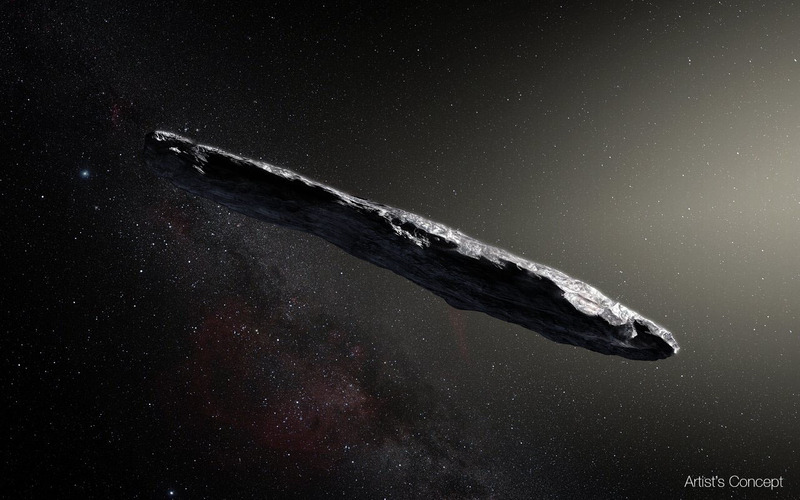 Above: This artist’s impression shows the first interstellar asteroid: Oumuamua. This unique object was discovered on 19 October 2017 by the Pan-STARRS 1 telescope in Hawaii. Subsequent observations from ESO’s Very Large Telescope in Chile and other observatories around the world show that it was travelling through space for millions of years before its chance encounter with our star system. `Oumuamua seems to be a dark red highly-elongated metallic or rocky object, about 400 metres long, and is unlike anything normally found in the Solar System. An asteroid that visited us from interstellar space is one of the most elongated cosmic objects known to science, a study has shown. Discovered on 19 October, the object’s speed and trajectory strongly suggested it originated in a planetary system around another star. Astronomers have been scrambling to observe the unique space rock, known as ‘Oumuamua, before it fades from view. Their results so far suggest it is at least 10 times longer than it is wide. That ratio is more extreme than that of any asteroid or comet ever observed in our Solar System. Using observations from the Very Large Telescope in Chile, Karen Meech, from the Institute for Astronomy in Honolulu, Hawaii, and colleagues determined that the object was about 400m long, rapidly rotating and subject to dramatic changes in brightness. These changes in brightness were the clue to ‘Oumuamua’s bizarre shape. “Looking at the asteroid light curve database, there are five objects (out of 20,000) that have light curves that would suggest a shape up to an axis ratio of about 7-8 to 1,” Dr Meech told BBC News. But in other respects, ‘Oumuamua (pronounced oh MOO-uh MOO-uh), appears to resemble objects we know from closer to home. “We also found that it had a reddish colour, similar to objects in the outer Solar System, and confirmed that it is completely inert, without the faintest hint of dust around it,” Dr Meech said. “For decades we’ve theorised that such interstellar objects are out there, and now – for the first time – we have direct evidence they exist,” said Thomas Zurbuchen, associate administrator for Nasa’s science mission directorate in Washington DC. The Very Large Telescope (VLT) on the 2,600m high Cerro Paranal, in Chilean Atacama desert, Chile is ESO’s premier site for observations in the visible and infrared light. It was reported by BBC 03 February 2012, that astronomers on 02 February 2012 had succeeded in linking four telescopes in Chile, so that they operate as a single device, and by doing so created world’s largest virtual optical telescope. Together the four telescopes form a virtual mirror that measures a total of 130 metres in diameter. As regards how ‘Oumuamua became so elongated, Dr Meech explained: “There has been speculation among various team members about this. Sometimes very elongated objects are contact binaries… but even so, the pieces would be longer than most things in the Solar System, and our analysis shows that it is rotating fast enough that they should not stay together. “One of our team wondered if, during a planetary system formation, if there was a large collision between bodies that had molten cores, some material could get ejected out and then freeze in an elongated shape. The cosmic interloper was discovered by Rob Weryk, a postdoctoral researcher at the Institute for Astronomy and a co-author of the new study, which is published in Nature journal. Weryk and fellow Institute for Astronomy researcher Marco Micheli realised it was going extremely fast (with enough speed to avoid being captured by the Sun’s gravitational pull) and was on a very eccentric trajectory taking it out of our Solar System. The asteroid’s name, ‘Oumuamua, means “a messenger from afar arriving first” in Hawaiian.